It’s been awhile since I shared some of our cooking adventures. Here are some of the things we tried over the past month or so. I have included links to the recipes where available, many of these are easy and most are healthy. I have been wanting to try cooking scallops for some time now. The September 2010 Cooking Light Magazine had this recipe for Seared Scallops with Farmer Market Salad and it was delicious and easy to make. 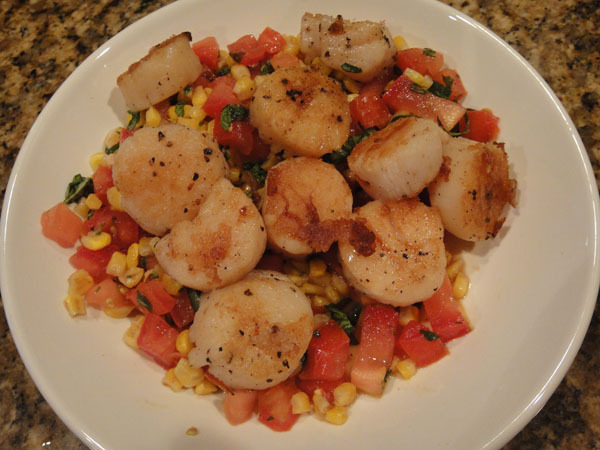 Although large scallops are a bit pricey and we could only find them at Whole Foods, so we won’t probably have them too often. Mike thinks they are a bit fishy, but I loved this. 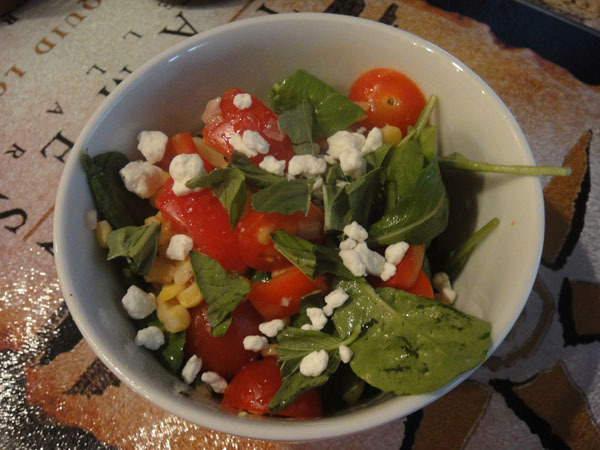 Very simple and great with fresh corn, tomatoes and basil. 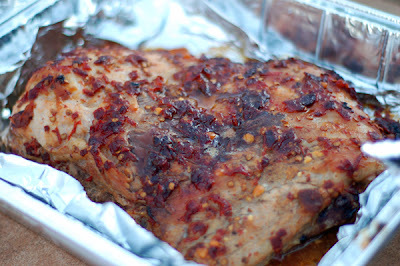 I didn’t care for our last rib recipe much, and discovered this recipe for Honey Chipotle Glazed Ribs on MarthaStewart.com. The sauce was the perfect mix of sweet with just a slight hint of spice. To go with the ribs we made Red Potato Bliss Potato Salad with Blue Cheese, Bacon and Chives also from MarthaStewart.com. The tang from the blue cheese was perfect. 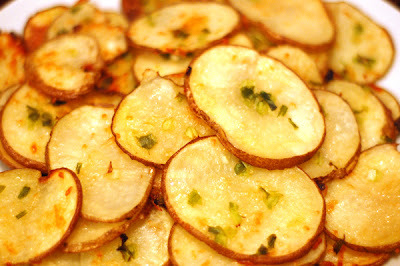 Mike found this recipe for Chive Parmesean Potato Chips on MyRecipes.com we have made it a few times recently with mini burger sliders and hot dogs. It is pretty easy to make if you have a slicer to slice the potatoes. Even thought it isn’t quite fall weather here in Arizona, we have been pretending. 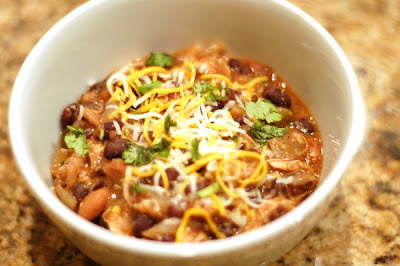 We made this Chicken Chili in the crock pot the recipe was modified slightly from a crock pot cookbook we bought at Costco. This was so good we are having it again this weekend. 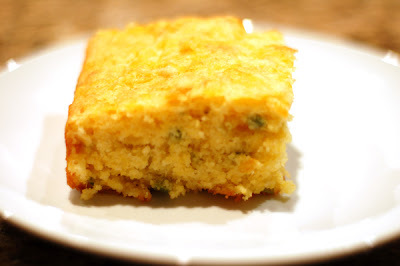 To go with our Chicken Chili Mike found a recipe for Jalapeno Corn Bread on foodnetwork.com. I think it is this one we made. It was very very good and I can’t wait to have it again. 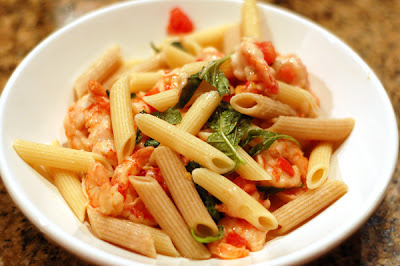 We had a lot of leftover tomatoes and basil one week, so I cooked some pasta, and diced and sauteed tomatoes with chopped garlic, fresh ground pepper, shrimp, torn basil in olive oil and added mozzarella cheese chunks toward the end. It was a quick easy dinner thrown together from leftovers. Golden Corn Salad with Fresh Basil from the September 2010 Cooking Light Magazine. 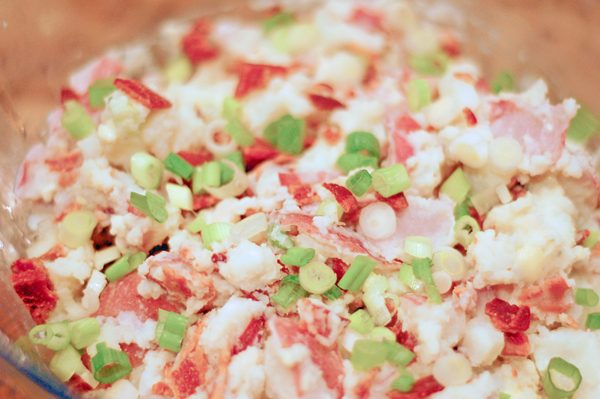 We made this as a side salad with something else and ate smaller portions and saved the rest for leftovers, but this is really hardy enough for a meal sized salad. 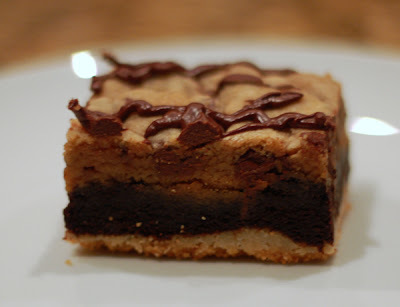 Motherlode Layered Cookie Bars from Picky-Palate. These took a little time to make since you are making 3 of the 4 needed cookie doughs from scratch. But they were oh so worth it. I cut them up smaller than she suggested and we also kept the edges which were still yummy. I took in a bunch to the office and they were devoured. Wow, it all looks so, so yummy! Oh yum!! It was so nice to finally meet you today Michelle! Let's definitely get the families together some weekend soon! !